Ohio Gov. John Kasich was rebuked when during a campaign event in New York almost three weeks ago he used a knife and fork to eat a slice of pizza. The candidate then switched to eating sans silverware, hand to mouth. Liberal New York City Mayor Bill de Blasio, who has faced the scorn of knife and fork pizza eating himself, defended Kasich’s silverware decision. 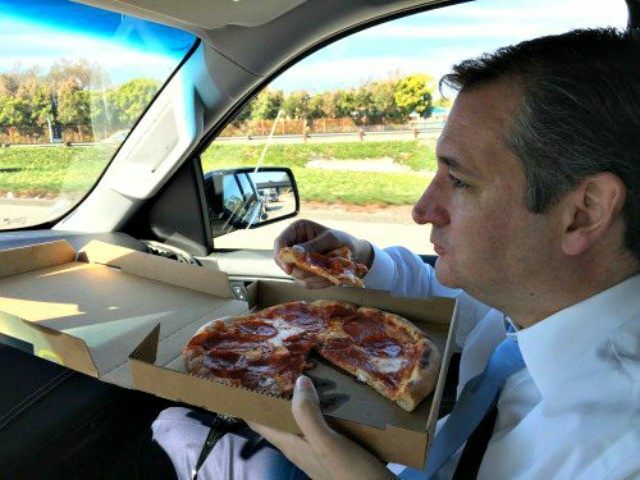 GOP frontrunner and native New Yorker Donald Trump has also been seen taking knife and fork to pizza. During a meeting in July, 2011 with former Alaska Gov. Sarah Palin, Trump and Palin each used silverware to eat their Famiglia Pizzera slices, according to the NY Daily News. The 2008 Vice Presidential candidate gave Trump a resounding endorsement for president shortly before the Iowa caucuses. She has since joined Trump on the campaign trail in several states including Iowa, Florida, and Wisconsin. An accident involving Palin’s husband Todd caused her to rush home around the time of the Florida primary election.